Watshamiella Wiebes 1981( in Bouček, Watsham & Wiebes). Type species: Watshamiella alata Wiebes 1981 ( in Bouček, Watsham & Wiebes). 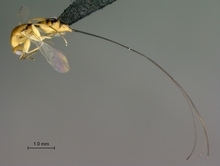 Hyperparasitoids of Sycoryctinae using oviposition holes made by Sycoryctes andSycoscapter species (Compton et al. in press). Bouček Z., A. Watsham & J.T. Wiebes, 1981. The fig wasp fauna of the receptacles of Ficus thonningii (Hymenoptera, Chalcidoidea). Tijdschrift Voor Entomologie, 124(5): 149-233. Compton, S.G., van Noort, S., Mcleish M., Deeble, M. & Stone, V. In press. Sneaky African fig wasps that oviposit through holes drilled by other species. African Natural History.